Pet insurance: Does Yours cover dental care? August has arrived and Canstar are celebrating Dental Care Awareness Month by telling all pet owners to give their pets a dental health check-up. Research from Roy Morgan shows New Zealanders are big fans of pets, with more than half (58%) of Kiwis owning at least one cat and/or dog. And we care about those pets, with 15% of us (330,000 Kiwis) paying for pet care services every month. Dogs are more expensive when it comes to healthcare. 1 in 5 dog owners pays for a vet visit once a month, compared with less than 1 in 7 cat owners. A spokesperson for Pet-n-sur, one of New Zealand’s largest pet insurers, told the NZ Herald their most common pet insurance claims in 2013 were for pets swallowing a foreign object, followed by accidental injuries including knocking a tooth out. Checking your pet’s dental health is vitally important even if they don’t accidentally knock a tooth out. Common dental illnesses include gingivitis gum inflammation, which leads to periodontal (gum) disease and serious bacterial infections. These bacteria can cause bone infections or nasal infections, making it hard for your pet to breathe, or they can enter the bloodstream and damage your pet’s heart, liver or kidneys. The best defence against dental disease is preventing it by keeping their teeth clean and getting regular checks to pick up little problems before they become big ones. Does your pet’s dental regime cut the mustard? Dental check-ups can be done at your twice-yearly visits to the vet. You can take care of your pet’s teeth yourself in the meantime by brushing their teeth with pet toothpaste and a finger brush, and/or giving them dental food chews and dental chew toys. You don’t even have to head to the vet or the pet store to buy dental chews or a tooth-brushing kit. John La Rosa of Roy Morgan Research New Zealand reported that around 60,000 Kiwis in total – 1 in 25 dog owners and 1 in 40 cat owners – buy their pet food and pet care products online. Online pet supply shops include Pet Central (formerly known as Cyber Pets) and Pet.co.nz. Dental chews are great for cats because they have tiny mouths, so they don’t like getting their teeth brushed. The Feline Greenies Dental Treat Pack for cats is one option – their crunchy texture helps reduce tartar build-up and they have added vitamins, minerals, taurine and chlorophyll to freshen breath. They’re only 1.25 calories per treat but they come in three flavours cats love: oven-roasted chicken, ocean fish, and savoury salmon. Royal Canin Cat Oral Care dental food is specifically recommended for cats with bucco-dental sensitivity or who are prone to oral and digestive trouble, to combat dental plaque and tartar build-up. According to New Zealand’s largest in-home pet care provider Pet Angels, dental chews or dog biscuits designed to reduce tartar build-up are a great alternative to brushing their teeth every day. Greenies Dental Treat Pack for dogs are a good option as they freshen the breath and reduce dental tartar accumulation by 87% on average. They contain hexametaphosphate, a calcium chelator, and chlorophyll to freshen the breath. Studies have shown dogs will actually choose Greenies over rawhide chews and sometimes even pig’s ears! For a dental chew toy, you should try your dog on Nylabone Dental Pro Action fake bones. These textured fake bones satisfy a dog’s natural urge to chew while reducing tartar and massaging gums to prevent gingivitis. Or instead of giving your dog a bone, why not give them a rope to chew on? Jerry the Giraffe and his other zoo mates Hank the Hippo and Louie the Lobster are hand-tied and vegetable-dyed rope toys that fray as they get chewed and act as dental floss. 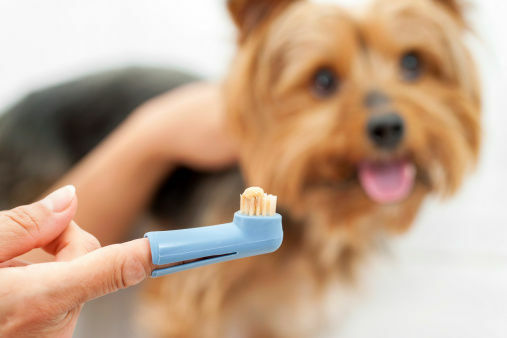 Finger brushes are the other recommended way to clean your dog’s or cat’s teeth. It’s a common misconception even among vets that giving your dog a bone to chew on will clean their teeth, but Dr Ky from Petmed Pet Health Insurance says that’s not the case. In fact, eating raw bones can break your dog’s teeth and give them pancreatitis because bones contain so much fat. You can get finger brushes online or from your local pet store. On Pet Central, you can buy a finger brush for dogs separately or in a Hartz total dental care pack including a pet toothpaste, a finger brush, and a soft toothbrush for large dogs. Don’t use human toothpaste on your pets, as it is not meant to be swallowed (which is what animals do). Pet toothpaste comes in delicious beefy flavours and is designed to be swallowed and digested. For more information on how to brush your dog’s teeth, check out the Pet Angels guide to dog care. Is dental care covered by pet insurance? According to an investigation by the New Zealand Herald Consumer Watch, most pet owners will get the best value for money if they look for a policy that covers basic vet care. Teeth cleaning and other dental care can be taken care of at your visit to the vet, but you should find out whether dental care is specifically covered by your pet insurance. Most pet insurers in New Zealand do not cover preventative dental care, but they often cover treatments for dental disease as an optional extra. Of the three main providers of pet insurance in New Zealand, who covers dental care and who doesn’t? Southern Cross Pet Insurance (formerly known as Ellenco) has dental care as an extras option specifically covering gingivitis, abscesses or tooth removal. Petplan Pet Insurance, the world’s #1 pet insurance provider, covers gum disease and tooth extractions under its policies but specifically excludes preventative dental care or professional teeth cleaning. However, your policy is only valid if you get annual health and dental check-ups for your pet. Pet-n-sur does not cover routine dental treatments under any of its plans. This Dental Care Month, make sure your pet’s dental health is covered. Let’s bring back those pearly white fangs!